Intel has announced the industry’s FPGA (first field programmable gate array) FPGA with integrated HBM2. The Intel Stratix 10 MX is said to “offer up to 10 times the memory bandwidth when compared with standalone DDR memory solutions” and is built on the firm’s 14 nm FinFET manufacturing process. The bandwidth on offer makes the new FPGA a great choice for accelerating high-performance computing (HPC), data centres, network functions virtualization (NFV), and broadcast applications where fast mass data transfers are key. The new Intel Stratix 10 MX is constructed using HBM2 stacks connected in layers using TSV technology. 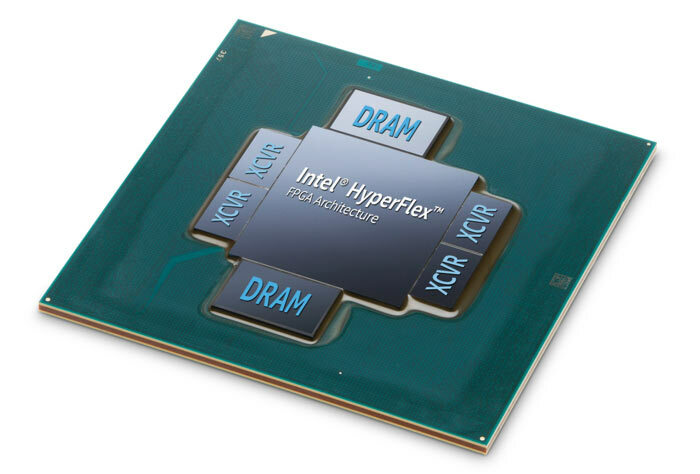 Intel’s Embedded Multi-Die Interconnect Bridge (EMIB) speeds communications between the memory and FPGA fabric, creating a high-performance monolithic FPGA fabric with tight HBM2 integration. It is claimed that this construction eliminates memory performance bottlenecks and is power efficient. Intel highlights the utility value of its Stratix 10 MX chip in HPC environments. For example HBM2-based FPGAs can compress and accelerate larger data movements compared with stand-alone FPGAs. The Stratix 10 MX FPGAs can “simultaneously read/write data and encrypt/decrypt data in real-time without burdening the host CPU resources,” claims Intel. The Stratix 10 MX isn’t the only new FPGA from Intel. It is shipping several more variants to meet the needs of various customers. Other chips that are shipping now include the Intel Stratix 10 GX FPGAs (with 28G transceivers) and the Intel Stratix 10 SX FPGAs (with an embedded quad-core ARM processor). More ramblings. Another one of Groo the Wanderer meltdowns, like his Intel Gemini Lake launch article. What is up Charlies arse at semi? he really has such weird hatred for Intel. Hes like a negative mental case with writing skills. I stopped wasting my time visiting semi wackurate.